As we announced few time ago, Google has decided to accelerate the transition to a more secure web by imposing the HTTPS standard. In order to allow your forums to follow this evolution, Forumotion has the pleasure to announce the setting up of a new option on its forums. You have now the possibility of passing your Forumotion forum in HTTPS. In addition to offering a secure web space to your members, your forum will display a "Secured" label on web browsers. However, note that this option is still in Beta. Its evolution as well as its availability on the whole Forumotion service will be done in a progressive way. How to get secured HTTPS url in my forum ? 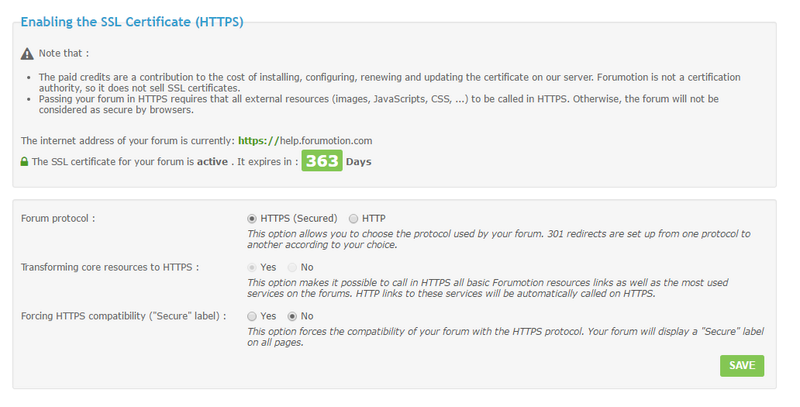 The cost of installing and configuring the SSL certificate on the forum is 500 credits for a 12 month renewable period. What are the conditions for my forum to switch to HTTPS? Phase 1: Transition to HTTPS will be possible only for forums located on the main Forumotion domains with a basic url without a custom domain name. Phase 2: Transition to HTTPS will be possible for forums located on the main Forumotion domains and having a custom domain name acquired via Forumotion. Phase 3: Transition to HTTPS will be possible for all other forums. Also note that once HTTPS is enabled on the forum, the "SSL Certificate" option disappears from the admin panel. Because the SSL certificate is closely related to the forum url on which it was installed and configured, the administrator will not be able to modify the forum url as long as the SSL certificate is valid. If necessary, the administrator can make a request to revoke his SSL certificate directly on the support forum. This restrictive behavior is only adopted during the Beta phase of the SSL project. It will then evolve into greater flexibility once the process is thoroughly honed. Hoping that this new option will brings you full satisfaction! The "SSL Certificate" part no longer disappears from the administration panel after the SSL certificate has been acquired. In addition to displaying the remaining lifetime for the forum certificate, it displays a new "HTTPS protocol configuration" block that allows the administrator to choose after the forum certificate activation if he wants to keep it in HTTP Or HTTPS. These options also allow him to force the compatibility of the forum's core resources to the HTTPS or to switch to HTTPS, in a fully automated way, all the links of the basic resources on Forumotin as well as the most used services on the forums. So no more need to make manual link replacements for these services.